Big Daddy Alcoa As An aluminium Play? Total Dud! Commodities are on a huge upswing as this global economy recovers. I’ve written about copper, coal, and uranium companies to assess the winners and losers in those industries. This week, we look at aluminium. Consumption from Emerging Markets is playing a heavy part of the surge in demand. Many believe aluminium prices have a pop coming since the metal hasn’t rallied in any noticeable way with other commodities. If China, who has regularly processed its own aluminium, has to dip it’s chopsticks into the global pot for more resources, we can expect prices to shoot up, much to the delight of those of us invested in metal miners. Alcoa bottomed out in early 2009 and has had a difficult time rallying. 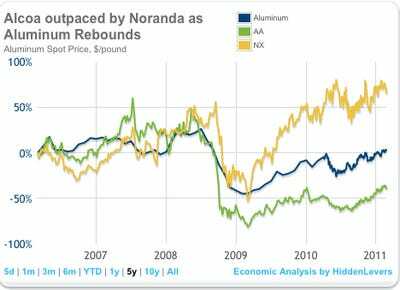 But Alcoa’s not alone: many large-scale aluminium manufacturers are having a difficult time following the spot price, much less beating it. CHALCO (ACH), Century aluminium (CENX), and Noranda aluminium (NX), a much smaller company in terms of Market Cap, are trending upward but have failed to consistently match the market. The best performers to aluminium are actually not aluminium companies, but rather, companies that manufacture various metals. 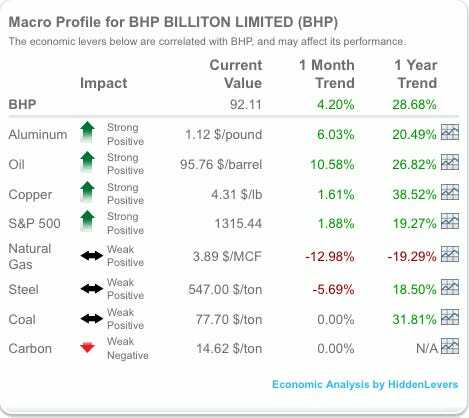 BHP Billiton (BHP) correlates beautifully to the spot price of aluminium but has managed to beat the aluminium spot price since early 2009. 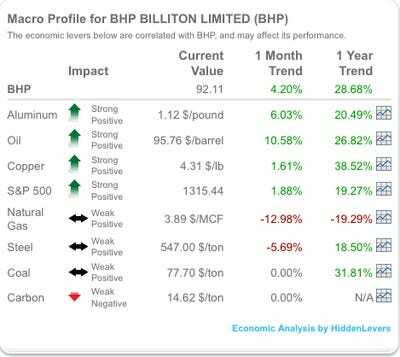 Other commodities are also highly correlated to BHP, making it highly attractive to those of us in the commodities market. Moral of the story – Not all companies within an industry are a good play on the sector – especially for commodities. Even more importantly, the best way to go long within an industry is to sometimes look outside of that industry. Macroeconomic indicators allow you to do just that by comparing the correlations across industries to pick winners.